We’ve all been in a situation where the dryer we’re using seems to be, sleeping on the job. Clothes aren’t getting dried properly, or it’s taking too long to get the proper effect. Many times, it’s frustrating. Especially when you’re looking forward to climbing into clean bedding with that freshly washed smell! That’s just so relaxing! When the dryer isn’t up to par, it can really ruin your experiences. Not to mention, adds so much time to your already busy schedule. There are two things you can do to increase the lifespan of your dryer: Moderation and maintenance. Moderation means that you don’t overload the dryer you’re using. 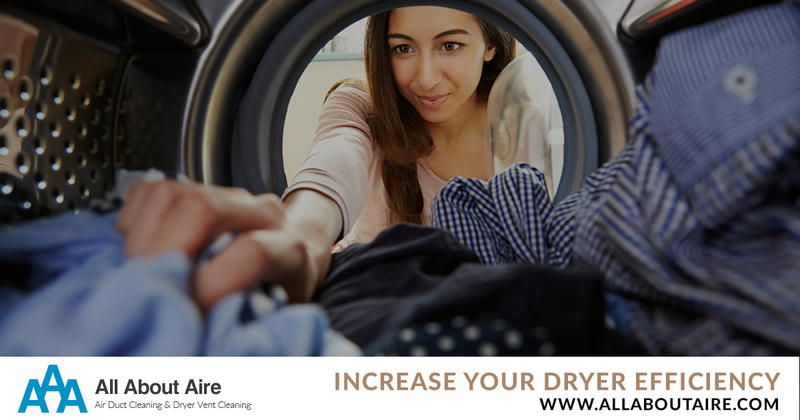 It causes too much pressure on the system, so the dryer won’t perform up to par. At the same time, putting too few items into the dryer can do the same thing! It’s really about using the recommended loading for your machine, not going over or under. This will help keep your dryer performing the way you expect. No extra time. No second loads. Just, the perfect dry every time. Now, modern dryers usually have a variety of settings available. One of the best things you can do for your dryer is switch the settings up. By using the same setting every time, your dryer is actually getting tired. Switching it up can help to keep all the gears functional. The second thing you need to do is provide regular maintenance. Most important: dryer vent cleaning. You know the dryer does have a vent to let air escape. Like with any other vent, letting it get clogged up can drastically affect the performance of the machine. It’s important that you do the best you can to keep your dryer vent clear and free of obstruction. Of course, not everyone knows how to thoroughly clean the dryer vent. If you’re one of those people, there are obviously professionals you can call in. Dryer vent cleaning isn’t something you want to “wing”. You want to know it’s getting done, and done properly. Dryer vent cleaning is as important as getting the vents cleaned in your home. These are your clothes and bedding. You’re expecting a certain level of performance from your dryer, right? Well, you’ve got to provide the same level of performance. Yes, it’s just a machine. But, it’s a hard machine to live without. Drying clothing on racks is great and great for the environment. Not everything dries well being hung up. Some things just, stay wet. The longer something stays wet from the washer, the more likely it is to develop a mold culture and eventually need to be thrown out. That seems like a lot of extra effort when you can simply hire a professional for a good dryer vent cleaning! Regular maintenance isn’t even troublesome. You can schedule a cleaning every six months, or whenever you noticed your dryer isn’t performing very well. Just remember to be conscious about the condition of the dryer vents. A backed-up dryer vent is only going to be problematic!